← $500 Carolina Bridal Show Gift Card Winner! It’s Watch Wednesday! Have you ever wondered what makes your watch tick? Obviously a battery makes it work, but the mechanical parts inside our watches… how do they all coordinate together to make the hands move on the face? 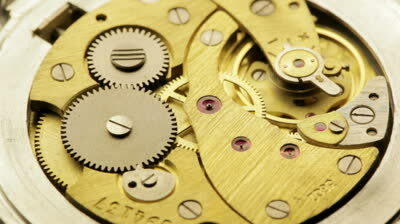 Below is some interesting information about the inside parts of our watches. Heads up: Technical Jargon ahead! How does an Automatic Watch work? An Automatic watch winds itself, from the movement when you wear it on your arm, making winding it unnecessary. Other automatic watches require manual winding on a daily or weekly basis; still others use mechanical or solar energy to charge a battery driving a quartz movement. 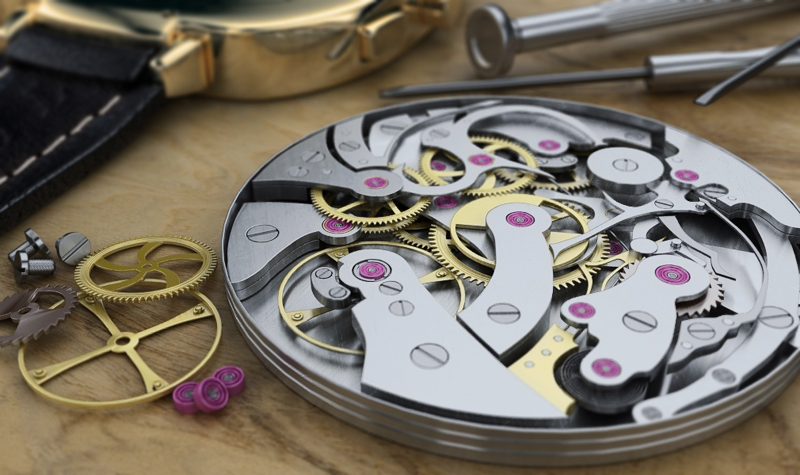 How does a Mechanical Watch work? A mechanical watch uses a mechanical mechanism to measure the passage of time, as opposed to modern quartz watches which function electronically. It is driven by a spring which must be wound periodically. Its force is transmitted through a series of gears to power the balance wheel, a weighted wheel which oscillates back and forth at a constant rate. Mechanical watches are not as accurate as Quartz watches and are generally a bit more expensive. Until the quartz revolution of the 1960s, all watches were mechanical. How accurate were the first watches made? Early watches were terribly imprecise; a good one could vary as much as 15 minutes in a day. Modern precision (a few seconds per day) was not attained by any watch until 1760, when John Harrison created his marine chronometers. Precision was attained as from 1854 first by the Waltham Watch Company, through the industrialization of the manufacturing process of the movement part, in order to attain the necessary precision: they won a Gold Medal at the 1876 Philadelphia Centennial Exposition with a lot of watches taken at random out of the production line, showing the way to their peers in U.S.A. (e.g. Elgin Watch Company) and the worldwide watch industry. Can you over wind a watch? Self-winding mechanisms would continue working even after the mainspring was fully wound up, putting excessive tension on the mainspring. To prevent a watch from being over wound, a slipping clutch device is used on the mainspring. Interesting! What is your favorite watch? This entry was posted in Jewelry, Watches and tagged how watches work, watch, watches, what makes your watch tick. Bookmark the permalink.